Early summer mornings, just after sunrise, we see the beautiful blue sky light up from the easterly sun. Dabbled with a few decorative pieces of pink cotton candy, the sky’s gorgeous rays meander through the gaps in the pine trees at the Tom Stuart Bicentennial Dog Park, and the beauty creates a deep breath in my chest. As the morning moves to 60 minutes past sunrise, the sun’s radiation prompts a familiar morning breeze that pushes aside the 10,000 pounds of humidity settling on my chest and hurries along the the flock of no-see-ums getting in their last bit of work on the tops of my feet. 90 minutes after sunrise, the morning birds have eaten their breakfast, and they settle back in their nest for an early morning nap. The clock ticks. And ticks. And ticks. Ahhh, finally, about two hours after sunrise, it’s time for that familiar sound. First just one caw. 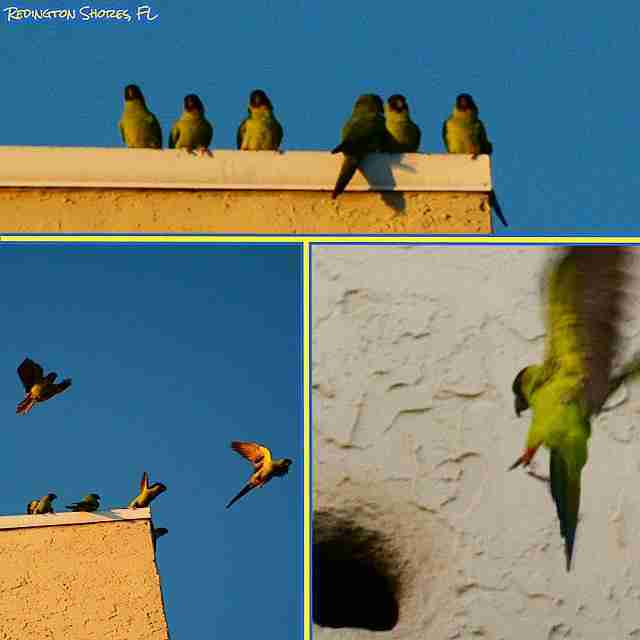 Then two, and quickly a dozen “cawk, gawk, caw, caw” The Pinellas Parrots; reporting for duty. Wild parrots: one of my favorite sounds that you won’t hear anywhere else [well, maybe, but definitely not in Ohio]. If you are already working in your office by the time the parrots decide to crawl out of bed, you can hear their unmistakable call about 30 – 45 minutes before sunset. I catch them before the flock of seven swope into their bird house behind Kenny’s Corner in Redington Shores. A larger flock of about twenty get their 12 hours of rest here at BiCentennial Park. Another crew calls the dead trees and berry bushes behind Mad Beach Craft Brewing in John’s Pass their home – though sometimes the local osprey push them aside…bullies! About once a week, a local convention forms, and all the small flocks make a super flock that numbers nearly 100 parrots. I’ve only seen it twice, but it’s so cool to watch them fly from Madeira Beach, north through Redington Beach. The smaller flocks will peel off to go home, then another, then another until the entire super flock is gone by the time they reach Park Blvd. Before you say it environmental guy, yes, they are a non native species…but so are about 80% of the human population – let’s take care of those slobs before we worry about exterminating the pretty parrots! Where are your “favorite” spots to check out the local Pinellas Parrots?